In the shadow of the recent presidential election, MIM(Prisons) takes this opportunity to explain some of the many reasons we don’t participate in elections under capitalism. We reiterate the MIM slogan: Don’t Vote, Organize! The problem with electoral politics is when the waters get muddied on a national scale between two imperialists who throw progressive-sounding bones to the left in an attempt to garner votes. Unlike City Council members, Congress and the President are fundamentally reactionary just by nature of their role in the capitalist system. It is their job to support and promote imperialist policies of global aggression. Sure, there may be alleged differences between imperialist candidates. One might deny the existence of global warming while the other offers platitudes about how we need to help the environment. Or one might advocate shipping all migrants back home and demand identification papers be carried at all times, while the other claims to oppose this law and wants to grant green cards to people already in the United $tates. That’s something with a real immediate impact on the lives of the oppressed. But the problem is, both of these candidates will have to support much more fundamental and wide-reaching repressive imperialist laws and actions. Both will support enforcing the imperialist borders, and exploiting cheap Mexican labor. There is no real choice under imperialism. The majority of the world’s people suffer under the rule of Amerikan imperialism, but they don’t get a vote in the elections. Amerika has streamlined the elections to just two parties, with very minimal differences between them. And the majority of the Amerikan people, bought off with imperialist superprofits given to them as a birthright, are perfectly fine with these “choices.” Both candidates represent the material interests of Amerikan citizens. It is the imperialist system that ensures sufficient superprofits from exploitation of Third World people to keep the First World citizens so well off. The election of President Obama four years ago should have been the best possible lesson for Amerikan activists. Many so-called progressives got behind the Obama campaign, excited to finally have a Black man in power, and believing the minimally progressive rhetoric they heard from Obama. But putting a Black face on imperialism didn’t change imperialism. 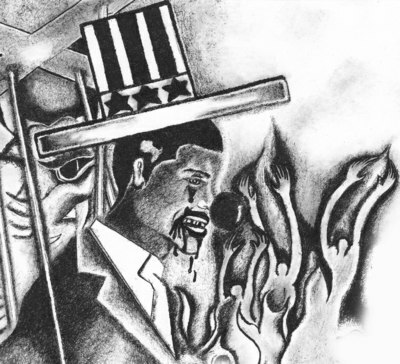 Before Obama was elected we wrote about his campaign as a good representative of imperialism. Under Obama, Amerika has continued its role as global oppressor, invading Third World countries to install or support U.$.-friendly governments, enforcing strict imperialist borders at home to keep out the oppressed, and maintaining the largest per capita prison population in the world. While we didn’t campaign around any electoral politics this year, nor vote, the results can be interesting to us as the largest scale polling of the Amerikan population and its internal semi-colonies. While the exploited people of the world did not get to vote for the President of the Empire, historically oppressed nations with U.$. citizenship did. As we work to expand our analysis of the internal semi-colonies’ relationships to imperialism, we can look at elections as a relative, if not absolute, measure of assimilation. The most explicit example of this came in the 2012 plebiscite on the status of Puerto Rico among Boricua voters. While inconsistencies in the format of previous plebiscites make it hard to decipher trends with a cursory assessment, it does appear that a majority rejected the current commonwealth status of Puerto Rico for the first time. The government is counting the statehood option as the victor with a 61% majority of those choosing an alternative to the commonwealth status. But really, only 48% of those who voted chose statehood, with 26% of voters choosing sovereign free association and 4% choosing independence. (1) About 22% didn’t select a new status. Since 46% voted to remain a commonwealth, it seems that many of them chose a new status as their second choice. Originally the two votes were to occur separately, which would make interpretation of the results easier. The option of “sovereign free association” was new in this plebiscite, and seems to reflect the more bourgeois nationalist among the neo-colonialists. They want to have their cake and eat it too. They want more freedom to act independent of the U.$. while keeping the financial benefits of U.$. social services that they receive today as a commonwealth. The 2012 plebiscite did have the largest turnout yet, with 79% participation. (2) This adds a little more weight to the small shift from a plurality favoring commonwealth to a plurality (at least) favoring statehood. At the time of the last plebiscite, in 1998, MIM reported strong assimilationism among the Boricua population due to economic interests tied to accessing the superprofits obtained by the U.$. from the Third World. (3) While MIM never believed that the meager 2-5% vote for independence was genuinely representative of the Boricua people, neither is true self-determination on the immediate horizon despite nationalist rhetoric from many political parties. A survey of the desires of Boricuas for self-determination is not valid until real self-determination is actually an option on the table. Unfortunately real self-determination won’t be possible until Boricuas are organized against Amerika and its lackey leadership in their homeland. Some have hypothesized that the economic downturn helped increase the statehood vote as Boricuas felt the crunch and wanted closer economic integration into the United $tates. This makes economic sense. So it’ll take much more extreme crisis before economic demands become revolutionary for the internal semi-colonies of the United $tates. Trends in Black voter participation in the last two presidential elections indicate that the neo-colonial effect is real as Blacks have come out at higher rates, with Black youth being the most active voter participants. While Latinos were also brought out by Obama in the last two elections, Latino youth voting and “civic engagement” has lagged behind Black and white youth, yet they were twice as likely to participate in a protest than their counterparts of other nations according to a 2008 report. (4) In 2008, Black voters closed the gap with white voter participation, which averaged around 10% in the previous five presidential elections. This year, Obama brought similar rates of Blacks to the polls. In the same period, Latinos and Asians have diverged from Blacks in their voter participation, who they have historically lagged behind already. (5) For Latinos this divergence corresponds to an increase in the percentage of people who are not citizens, and therefore can’t vote. We do not have data showing whether the same is true for Asians. While the non-participation may be enforced, rather than by choice, the Pew Hispanic Center also found in a recent survey that most Latinos identify with their family’s country of origin and not as Amerikans. (6) There is little doubt that the vast majority of Blacks identify as Amerikan. The connections that Latinos and Asians have to the Third World are a significant factor in their political consciousness and how they perceive the United $tates, their relationship to it, and their participation in it. Similar to supporting someone for City Council, discussed above, propositions are another relatively clear-cut realm of elections where we may organize around a particular issue. To look at more concrete examples of how this usually plays out, we turn to two propositions this year that addressed California’s prison population: Propositions 34 and 36. Proposition 34 was presented to abolish the death penalty, which sounds great at first. But in this case, death row prisoners actually recognized that the law was opposed to their interests in that it would prevent them from proving their innocence in court. They launched an active campaign to oppose Prop. 34 and it did fail. The weakness of the proposition was inherent to the limitations in the system to address justice in a real way. Proposition 36 is a reform to the Three Strikes law, and it passed. MIM(Prisons) welcomes the prospect of less people going to prison in California, and supposedly even current prisoners being released earlier. Yet, Three Strikes itself still exists. The reform will right a few egregious wrongs, but leaves Three Strikes, not to mention the whole criminal injustice system, in place. Even abolishing Three Strikes altogether would be merely a quantitative change in the oppression meted out by the injustice system, without changing the substance of it at all. Prop. 36 was promoted by those who want to reduce state spending on prisons, and clearly promoted the use of Three Strikes for the majority of prisoners it has been applied to. To campaign for Prop. 36 was to promote this position or to say that this is the best we can hope for. But there are only so many hours in the day! To spend them on organizing around these small changes means slightly less suffering in the short term, and much more suffering in the long term as imperialism marches on unchallenged. Reforms do play an important role while organizing in our current conditions, but we choose which reforms to support very carefully, weighing how they impact our organizing efforts against imperialism, and our real conditions on the ground. Our line is that imperialism cannot be reformed. Our strategy is to build institutions of the oppressed which are separate from imperialism in order to build up our own power. At times campaigning around an electoral campaign could be a useful tactic in that strategy. But strategically we are not trying to get elected in a popularity contest, or be on the winning team. We are struggling for liberation and an end to all oppression! As M-1 of dead prez put it on Block Report Radio the morning after the recent “presidential selection”: “I’m not thinking about today. And I’m not thinking about four years from now. And I’m not thinking about smoking marijuana. I’m thinking about 50 years from now being able to be the self-determining people who are raising a nation that’s based in stability.” Spoken like a true revolutionary, this is the type of thinking that we promote to develop an anti-imperialist political pole within the belly of the beast. Still not convinced organizing for revolution is more important than voting in Amerikan elections? Write in to get our “Don’t Vote, Organize!” study pack for $3. 1.AP. Puerto Rico’s voters endorse seeking US statehood but ballot results raise questions. 11/7/2012. 3. MIM. La Lucha Boriqueña. – $3 from MIM Distributors.